The world couldn’t get enough of Michael Jackson in 1984. Even after the constant radio airplay and video rotation generated by Jackson’s 1983 pop masterwork, Thriller; we still wanted more. And Michael delivered. Instead of taking a break after the insane success of Thriller – Michael Jackson ran a victory lap (pun intended) in 1984. To commemorate the 5th anniversary of his passing I’m going to post my 6 Favorite Post-Thriller Michael Jackson Releases from 1984. These are the songs either sung, written or produced by MJ that came out in the great (greatest) year of pop. Read here to see why I think 1984 was such a pivotal year for Jackson. #6 Somebody’s Watching Me by Rockwell. Chorus vocals by Michael Jackson. Joining me to discuss this song is Cutie Pie, the author of my absolute favorite Michael Jackson blog – All Things Michael! Let’s all agree that without Michael this song would not be a hit. It probably wouldn’t exist. The verses, sung by Rockwell, are fun in a tongue-in-cheek/high quality novelty song kind of way. But then the chorus kicks in and you hear that unmistakable alto delivering yet another unforgettable melody and you think you might be listening to a great B-side from Off the Wall. One of the reasons I really like this song is because it illustrates Michael Jackson’s loyalty. 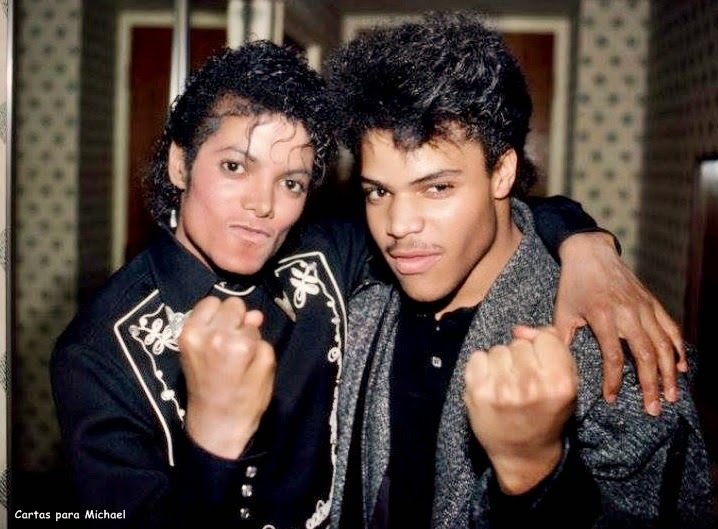 Jackson and Rockwell (otherwise known as Kennedy William Gordy aka Berry Gordy’s son) were childhood friends. I imagine there were hundreds of wanna be pop stars who were clamoring for a chance to collaborate with Michael in 1984. But Michael chose to sing on the song that would turn out to be his childhood friend’s only hit. And finally Cutie Pie makes a great point that this song tied into the themes of George Orwell’s 1984. Indeed! Just the Facts: Somebody’s Watching Me went to #2 on the US and UK pop charts and stayed at number 1 on the R&B charts for 5 weeks. Best Thing About the Video: Without hesitation or guilt I will state that Rockwell gives good shower scene. Coming up tomorrow . . . my 5th Favorite Michael Jackson Release from 1984. This entry was posted in Michael Jacklson, Number Ones, Tribute and tagged 1980s, 1984, Culture, king of pop, Michael Jackson, Music, Music Video, nostalgia, Number One Song, POP CULTURE, Pop Music, Rockwell, Somebody's Watching Me on June 23, 2014 by Sean. Thank you for the collaboration! It’s great to share one’s love for Michael with a fellow fan.